The shroud checks a body apparently killed by the hand, the police come in while he does. He subdues them and takes off, nearby someone watches him. 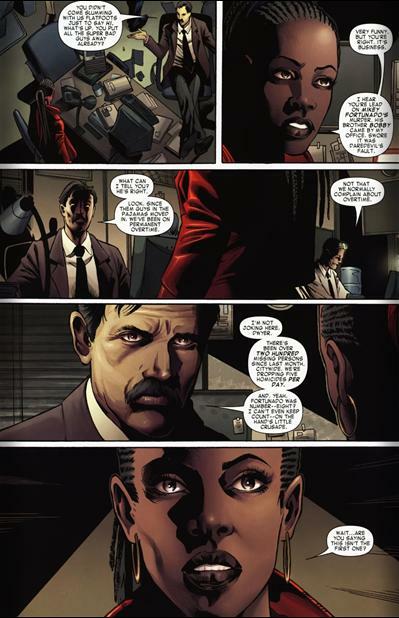 In the office of Misty Knight the man who was killed, his brother has come to seek her aid in sending a message to Daredevil. She refuses and they have a small tiff before she kicks him out. He brings to her attention the many killings the hand has done in the name of daredevil. The shroud shows up confirming what he said, he then departs. Elsewhere Silver Sable is looking for a man on the behest of Interpol for extradition. Misty goes to her old precinct to get more info on the killing. She finds out that their have been hundreds of them and the Hand behind them all. She gets a call from Danny who wants her to meet up with them to talk to Daredevil, they then discuss potential baby girl names since she thinks she pregnant. Silver sable in disguise infiltrates a prostitution and exotic dancing club to find her man, she arrives too late he’s been killed by the hand. When the police arrive she takes off, in the distance Daredevil’s Shadowland complex burns. The Shroud gets shot down by the person who has been following him, it’s Paladin who’s ready to kill him. The cover was wicked cool thanks to Francesco Mattina, truly a standout poster quality image. The story did its best at tying all the respective players together. 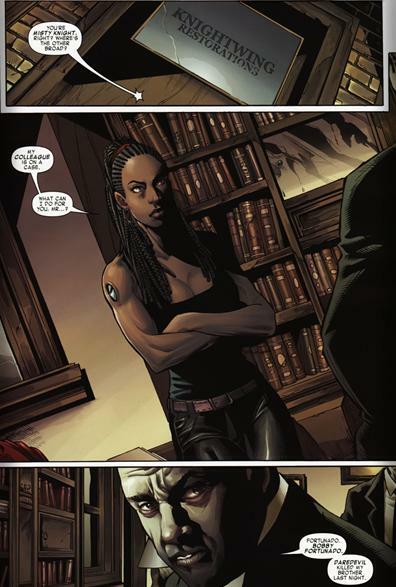 Misty and shroud get directly involved especially with Misty’s history with Daredevil. Silver Sable also gets drawn in near the end which will tie into future issues of the series and the upcoming New Heroes for Hire book. Characterization for Misty was spot on and the introduction of shroud who I know nothing about was handled well enough for me to get a handle on his power set and the general tone of him and the capacity in which he operates. It was a nice nod to current continuity with Misty and Danny talking about baby names since she thought she was pregnant at the time :). The issue also shows where the story fits into the overall Shadowland storyline well. Could not tell the nationality or race of the shroud, the opening pages are a bit much with the gaping throat wound and this will turn some readers off from the onset. Without knowledge of what going on in the shadowland storyline you may be lost. Misty not knowing about the Hands killings seems like a stretch, Hundreds of dead bodies of criminals and low lives and this “detective” missed it? Suspension of disbelief can only be taken so far. She was also far too quick in condemning what Daredevil was doing and calling him “crazy” when as one of his friends she knows that his life has been filled with more tragedies than most heroes will ever see. She also seems awfully concerned about the deaths of people who the world is a much better place without, BUT hey she’s supposed to be a by the book hero so I shall “bear’ with her.